CHARON, PLUTO - (@The Comedy News) - Scientists on Earth have discovered that Pluto and its moon, Charon, house a population of beings that are remarkably just as miserable as humans on Earth. "We have photographic proof that finally can confirm that yes, there is life out there beyond Earth, and it is just as miserable as life here on Earth," announced a professor at the Search for Extra Terrestrial Misery (SETM) in New Jersey. SETM has been in the business of searching the universe for life as miseable as that on Earth since 1989, when the world's first miserable reality-television show premiered, "Cops". Since then, the growing amounts of misery and shame on Earth have motivated researchers at SETM to discover miserable life on another planet. Pluto is the furthest planet from Earth within our solar system at 4.4 billion kilometers away. Still, there are many miserable facets of life that native Plutonians can empathize with that on Earth. After documenting many Plutonians in their daily miserable lives, Earthlings can now have a grasp of just how miserable life is on the other side of the universe. Also, Plutonains also relish the freedom of speech. And just like Earth, beings with the freedom to say whatever they want can have their miscreants. 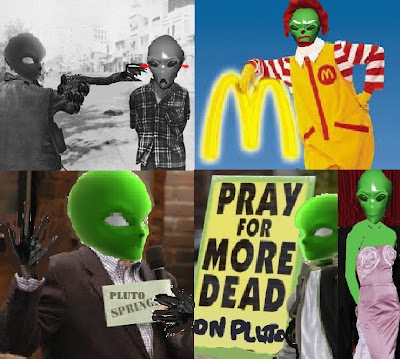 One splinter sect of Plutonians openly pray for the death of soldiers in the Plutonian army--some holding up signs that read, "Pray for More Dead on Pluto." For miserable entertainment, Plutonians enjoy watching interviews of fellow Plutonians confess their misdeeds to a wide audience in a talk show format similar to Jerry Springer or Oprah Winfrey. They also enjoy film festivals where they futilly dream of dressing as elegant as the famous Plutonians on television, including Natalie Plutortman, and Tony Danza. Pluto also boasts its most miserable, yet plentiful supply of nourishment: McDonalds. Scientists on Earth have discovered have video proof that former disgraced Enron chairman, Kenneth Lay, who has been presumed dead since 2006, was been discovered alive and miserable on planet Pluto.